We are delighted to introduce you to the latest edition of the Peoplehood Papers. This 14th edition is dedicated to Sustainability and Jewish Peoplehood. We decided to provide the Siach Network a public platform to grapple with the challenge of sustainability through the Peoplehood lens. With focus on shmita (the Sabbatical year – which has just begun) as the framework, authors from different disciplines consider what sustainability means for the Jewish People in the 21st Century. Some take an activist stance and call on us to renew our commitments to renewable energy sources and debt forgiveness to relieve the lives of the most vulnerable amongst us. Others understand sustainability in more spiritual terms, an opportunity to reconnect with the adamah (earth) and to remember that we are stewards not masters of the earth. Still others consider the ways in which a focus on environmental issues can be ‘common ground’ to rally around and unite the ever-growing disconnect between Jewish communities in Israel and world Jewry. Through their different perspectives, each author reminds us of the essential ingredients which make Jewish peoplehood vibrant – a focus on our collective mission as Jews, a rootedness in a common text, and creative thinking around how to continue to forge the connection between us, even when it feels tenuous. We sincerely hope that this exchange will inspire a conversation about the integration of our responsibility as Jews to our universe and to our collective mission as a People. We thank our Siach colleagues for their inspiring contributions. We welcome your comments and responses and look forward to continuing the conversation. Let us know what you think! 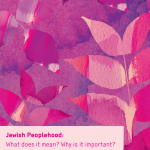 Read about Sustainability and Jewish Peoplehood here.